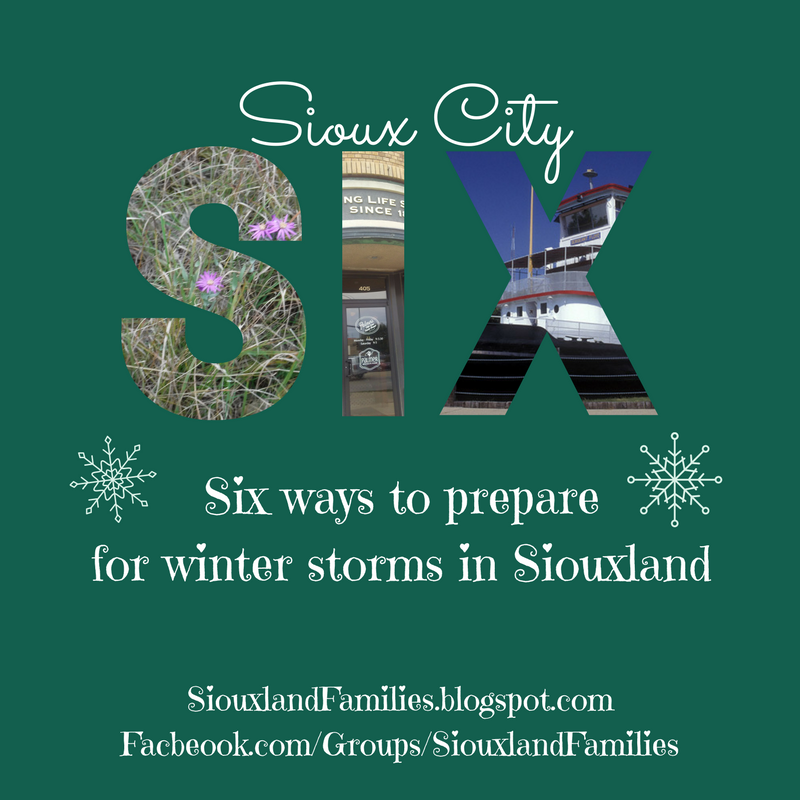 Prepare Your Family for Winter Storms! 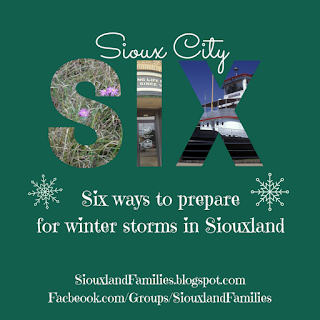 Something every Sioux City family can do today to be more prepared for winter storms is to make a plan. Think about things like how you will get your kids from school if the schools let out early because of weather, who will watch your kids on a snowday, whether you will stay home or go elsewhere if you have no power and/or no heat, and what you will need to have on hand in case you can't get to the store for a couple days (more on that below). Here is an example family readiness plan from FEMA you can use as a starting place, but feel free to ignore the parts that don't apply well to your family and add things in that are important to your family but might not be included! a weather radio like this one from Bomgaars helps you stay informed even when power and internet are down! Keep an eye on the weather more closely during the winter so you aren't caught off guard by storms when they do come. A few of my favorite ways to do that include watching KTIV or checking out their website and following the Siouxland Severe Weather Network Facebook page. A weather radio can also be a great option, as sometimes storms knock out cell phones and internet! If you have kids in school, I definitely recommend signing up to get text alerts when there are weather related closures, delayed starts, or early outs. For the Sioux City schools, sign up here. Make sure you have everything you need to stay safe in a storm, including a first aid kit and fire extinguisher. Check your backup heat, light, and power sources like your fireplace, space heater, oil lamp, flashlights, candles, and/or generator to make sure they're in good working order so you can replace or repair them and replenish accessories like batteries or oil well before a storm. Also make sure you have sturdy boots and a shovel and scraper if you will need to be outside and driving in potentially stormy weather. And keep 3 extra days of medications on hand for anyone in your household who needs daily medications or things like rescue inhalers or epi-pens. Hygiene items like menstrual supplies, diapers, toilet paper, and baby wipes are also important to have a 3 day supply of in case you can't get to the store for a few days. make sure you have a scraper and brush in your car! this hat is officially on my Christmas list...so cute! Make sure you have warm coats, gloves or mittens, hats, and blankets for each person in your house, and when travelling in your car, bring the cold weather gear for every person travelling in your car even if they aren't planning to wear it during that car ride. If your car breaks down and you have to walk to a gas station or wait for help to arrive, you don't want anyone to be in danger of hypothermia or frostbite, and they can set in quickly in little ones! Bomgaars has some serious coats and outerwear on sale this week and probably will many weeks during the winter. They also have small and large space heaters, which may be an appealing option for some families! how cool is this? it is apparently a heater that you can also use to cook! Trail mix is a great example of a high protein food that stores well and doesn't need cooked! Another important thing to have on hand is food and water. The recommendation is 3 days worth of food that you can eat or cook without electricity if needed (this is easy if you have a gas stove...just make sure you know how to light it without electricity!) and 3 gallons of water per person and per animal in your house (or 3 days worth of water for very small or very large animals who need significantly more or less than that). It is okay if you can't get this all at once! Add a few items to each grocery trip as your budget allows. Doing some is better than doing nothing. Some of my family's favorite kid friendly options that store well and don't need electricity to prepare include graham crackers, peanut butter, and canned peaches. I try to keep a bit extra of those things on hand in case of emergency, and I rotate it into our regular meals and snacks so it doesn't go to waste if an emergency doesn't happen before their expiration dates. You may also want to have a small amount of disposable plates and utensils on hand. These toy trucks light up! Such a fun option for kids if the lights go out! This is the least important step, but it is a nice one if you can get to it. Try to make sure you have something fun you and your kids can do even if there is no electricity and it is too cold to go anywhere for a few days. Playing cards, toy cars, board games and card games, glowsticks, crayons, stickers, and construction paper are all fun options to consider! Fun flashlights are also a great option as they provide light and entertainment both. I love the ones that project fun shapes. They keep my kids happy a long time! Anyway, it can make a big difference in morale for everyone if you have some entertaining choices for your kids to play with when the power is out. And if you can find some your kids don't play with often, consider keeping some in a special box or bin for storms, so the novelty of getting to play with them will be exciting too! And now the best part....a giveaway! Giveaway sponsored by Bomgaars for $25 giftcard to Bomgaars ended 11/27/2017.